We completed our 3 hour train journey to Nagasaki and headed straight for the War Memorial Museum. This museum wasn't as harrowing as the one we witnessed in Hiroshima - whether this was due to the exposure the day before the style of the museum I am not certain. On the 9th August 1945 at 11.02, the second atomic weapon was dropped on a city in human history. The heat of the plutonium bomb (c.f. Hiroshimas bomb was made with uranium) instantly killed everyone who was exposed outside within a 1km radius. It completely destroyed the city as many of the buildings were made from wooden structures and the fire burned late into the night. This weapon of mass destruction has had many of the same effects on the city and the residents exposed. As a result, Nagasaki are also asking for world peace and complete destruction of all nuclear warheads. They also have a peace register where countries and cities can join in with the effort for world peace. The mayor of Bristol joined in 1988. 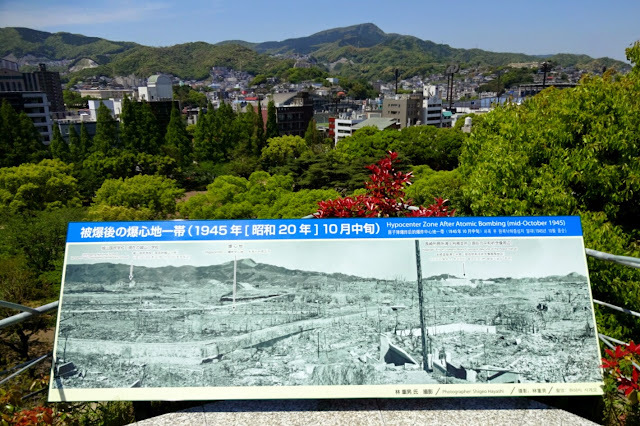 The Nagasaki Peace Park contains a section with concentric circles - the hypocenter of the bombs detonation. Next to it is the only surviving spire of the Christian Church that was 800m away from the explosion - a reminder of the power of the explosion. 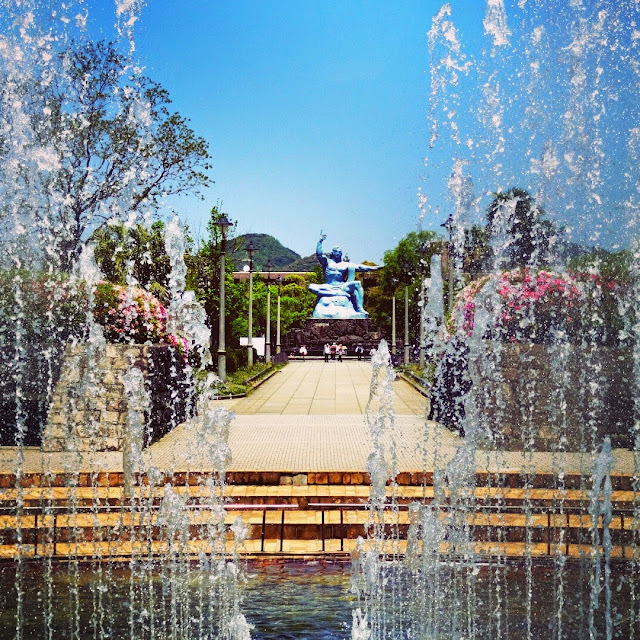 The fountain of peace was beautiful with huge water jets resembling the dove and peace. Unfortunately, in an effort to take a beautiful picture, Matt fell in. He soaked both his shoes and socks - hopefully not causing too much offence to the locals. Our next stop was another bomb damage site - the one legged Torii gate or the Sanno Shrine. This gate is located 800m from the hypocenter. The tremendous heat rays of the explosion blackened the upper part of the gate and the blast destroyed the pillar and crossbeams nearest to the hypocenter, leaving only half the structure to this day! 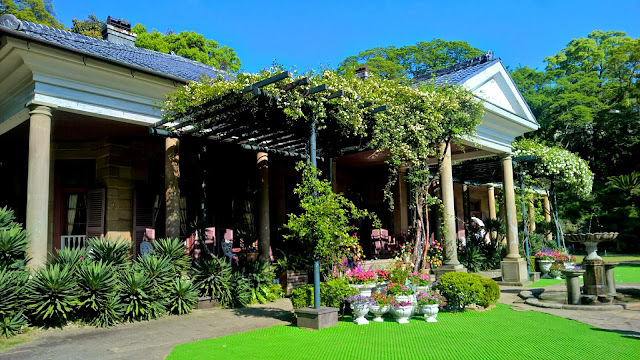 In the afternoon we headed towards the Western district and Hollander (Dutch) slope - most westerners that settled in Nagasaki during the Foreign Settlement Era were Dutch, and so westerners were often assumed to be Dutch. Around the slope were several western style houses depicting the settlement that existed here. 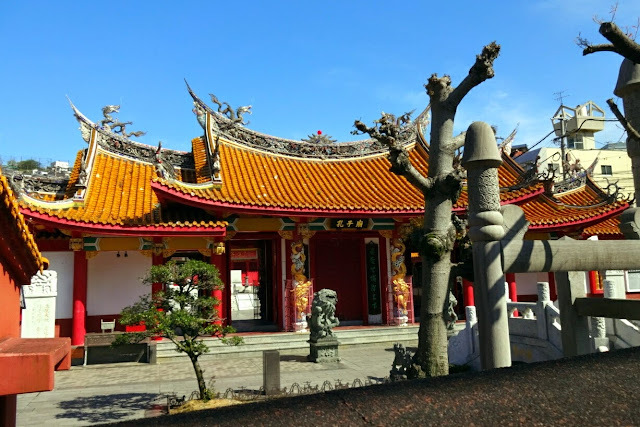 We then walked past a Confusion shrine - one of the only of its kind to be built outside of China. It was strangely better than many of the shrines we saw in China with huge dragons on its roof! Our final stop was Glover Garden. Glover was born in Scotland and came to Nagasaki in 1859 at the age of 21. 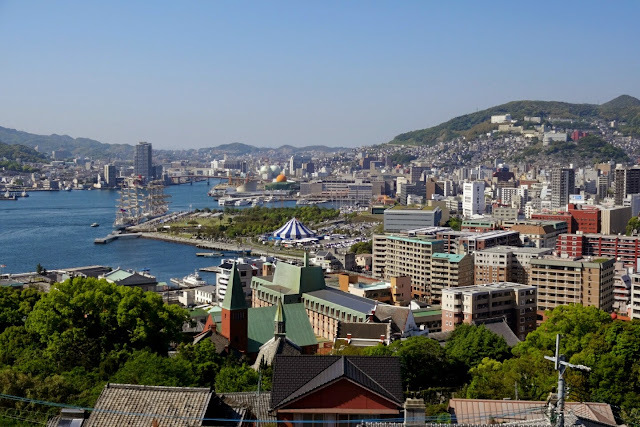 In Nagasaki he established the Glover Trading Company which focused on shipbuilding, coal mining and the tea trade. Here he built the first western style house and the became dominated with other western merchants who lived in and loved Nagasaki. The whole area was lovely abs the houses had a variety of artifacts on display, including portraits of Glover and his wire Tsuru. Nagasaki was a beautiful city and it was amazing to literally see a city that had risen from the ashes and rebuild into something amazing. It was a true testimatent to the people who lived there.